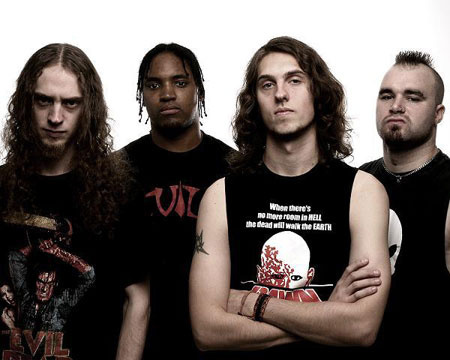 Sad news has just come our way that Mike Alexander of Evile has just died while the band were on tour with Amon Amarth. The Quietus has had the pleasure of spending time with these young lads and would like to pass on the condolences to the rest of the band, Mike's family and friends. Sadly, just a few days into their European tour with Amon Amarth, Evile's Mike Alexander was suddenly taken ill and rushed to hospital, but tragically passed away in Lulea, Sweden. There's so many things rushing through our heads that we want to say, do and feel. We half expect him to come round the corner and call us 'dickheads'. We can't get our heads around it. It upsets us so much that he was away from his family when this happened, although knowing Mike, we're at least glad he was on tour doing what he loves. We're lost for words. We all miss him so much already. He was such a headstrong, genuinely nice guy who loved music and his family. We've got so many brilliant memories with him. Our hearts go out to his daughter, family and friends at this tragic, difficult time. Mike is much loved and is sorely missed.